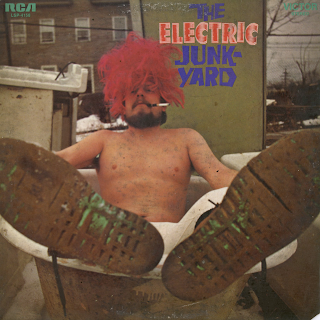 From the back cover: The Electric Junkyard uses the following instruments: two guitars (one rhythm, one solo), electric piano (plus organ), alto and tenor saxophone, tenor and bass trombone, trumpet and flugelhorn (all horns are electrified), fender bass, fuzz bass, drums and percussion. Also from the back cover: And now, a message from The Electric Junkyard. Dig it. 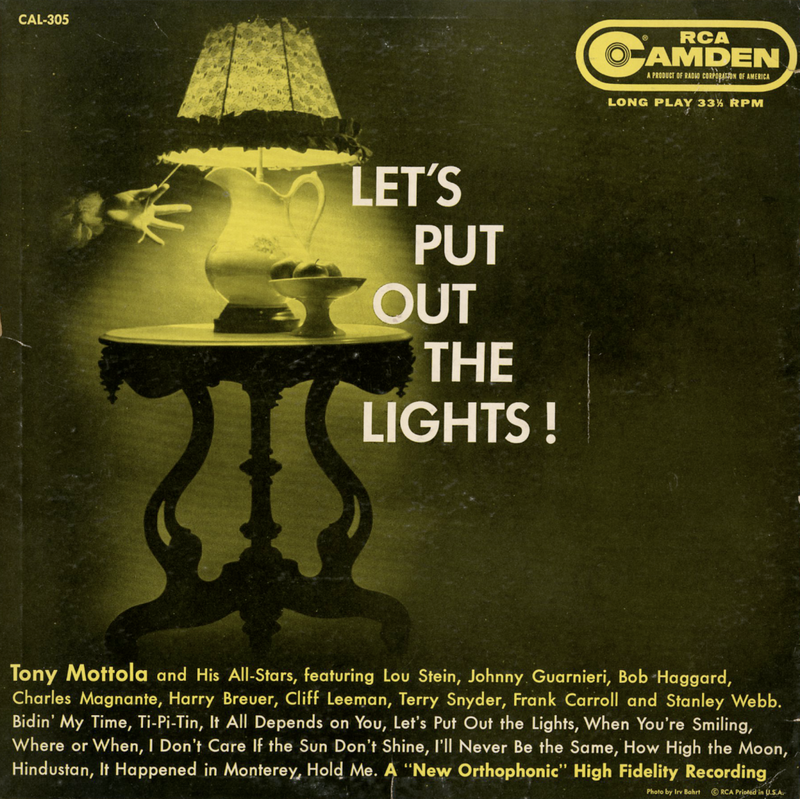 Let's Put Out The Lights! Featuring: Lou Stein, Johnny Guarnieri, Bob Haggard, Charles Magnante, Harry Breuer, Cliff Leeman, Terry Synder, Frank Carroll and Stanley Webb. 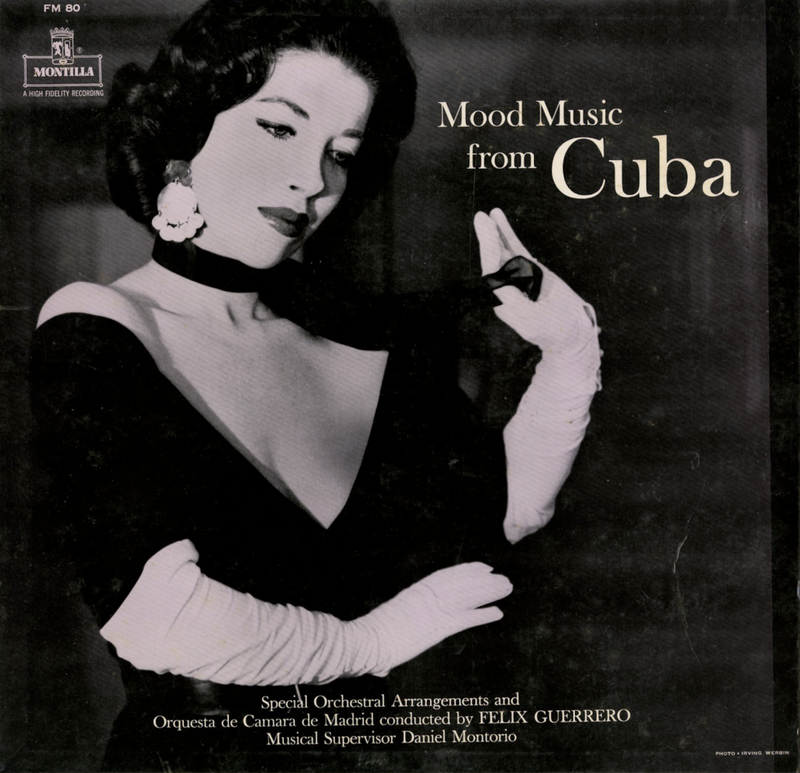 Somehow the peppy track, Ritmo De Congas De Oriente (featured above) managed to make its way onto this set of generally more subdued "mood" music. From the back cover: Felix Guerrero Diaz, the son of the famous guitar virtuosos, Felix Guerrero Reyna, was born in Havana on January 13, 1917. Still in his youth, Guerrero is one of the most firmly established talents in the Cuban musical scene. He began his studies under the direction of his father and with Isidro Laguna, in the Municipal Conservatory of Havana. Thereafter he studied harmony and counterpoint with the renowned Amadeo Rodin, and finally, composition with the Spanish composer and conductor, Pedro Sanjuan. 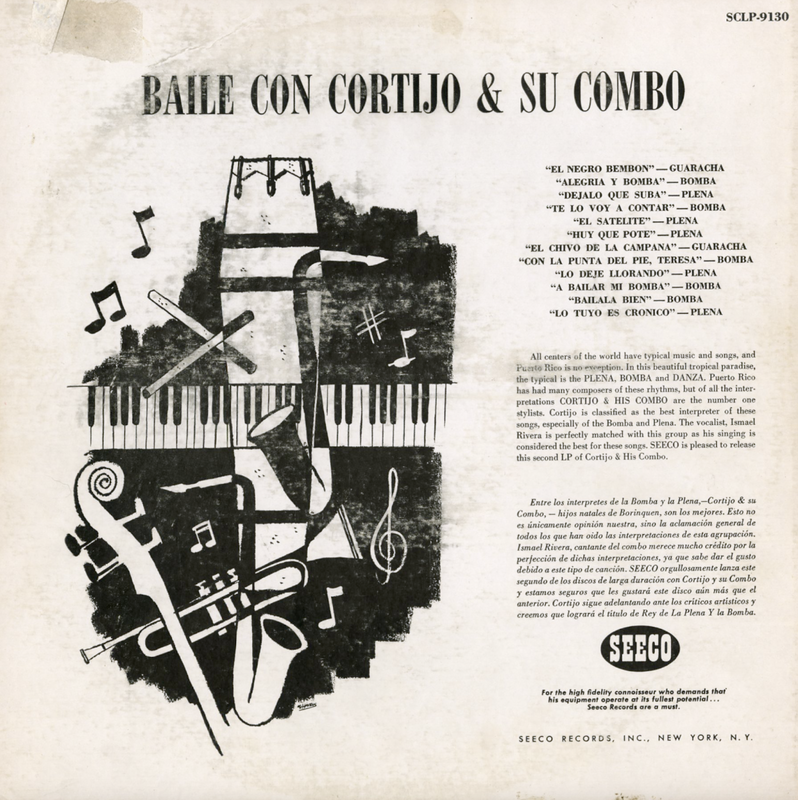 Eager to perfect his studies, Guerrero journeyed to the United States in 1947 to enroll at the Julliard School. Ultimately, he went to Europe where he took summer courses at the School Of American Art with Nadia Boulanger and Marcel Dupre. The Paris Conservatory followed where he completed his studies in composition with Nadia Boulanger and in conducting with Eugene Bigot. These extended years of study brought as accumulation of prized to Guerrero. 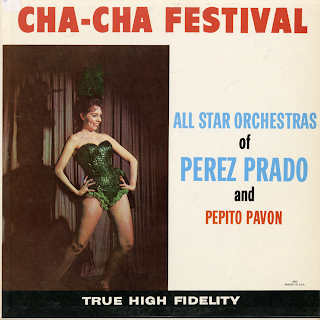 They were First prize for harmony and composition in the Academy of Maestro Pedro Sanjuan; Award for Composition in Paris; Honor prizes in Marianao of the Province of Pinar del Rio for his work in Cuban music, and, in 1955, he was singled out as the most distinguished director by the Radio and Television Chronicle. He was as composer, begun in 1937 followed an uninterrupted line of diversity and prolific achievement. He has tried all aspects of the music field with the same good fortune. He has composed music for the theatre, the motion pictures, symphonic, chamber, vocal, and instrumental; thus embracing every aspect of the music. 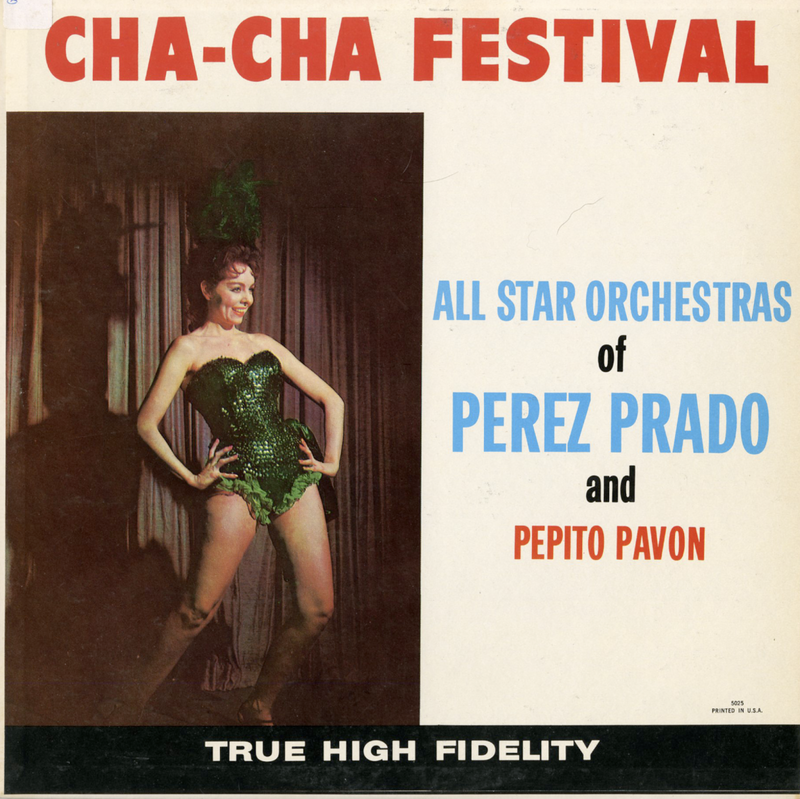 Among his important works, the following should be mentioned: "Chopiniana," an interesting bitonal experiment composed in 1953, "Cinco dances cabanas," "Sonatina for Viola and Piano," "Guajiras for Guitars," "Cuarteto para cured en re," the ballet "El rumbero maravilloso," "Rapsodia cubana," and innumerable nocturnes for orchestra, songs, etc. The musical ingenuity of Guerrero is definitely reflective of modern times in its harmonic structure; however, over-adventurous stridencies are absent and the music is invariably nationalistic in accent. In his work as orchestrator, he has a profound knowledge of orchestral timbre which he handles with great ease, and of impressionistic tonalities which he manages to blend with the native rhythms and strains of his country. Montilla engaged this notable Cuban musician, who is the director of Channel 4 of "Television National de Cuba," in order to record and conduct and anthology of Cuban instrumental works as well as some of the principal works of Ernesto Lecuona. Under Guerrero's direction, with the "Orquesta de Camara de Madrid" and a group of renowned Spanish artists, these recordings came to life in Madrid. From the back cover: All centers of the world have typical music and songs, and Puerto Rico is no exception. In this beautiful tropical paradise, the typical is the Plena, Bomba and Danza. 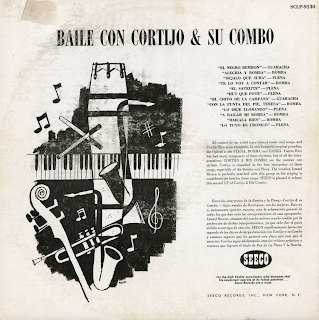 Puerto Rico has had many composers of these rhythms, but all of the interpretations Cortijo & His Combo are the number one stylists. 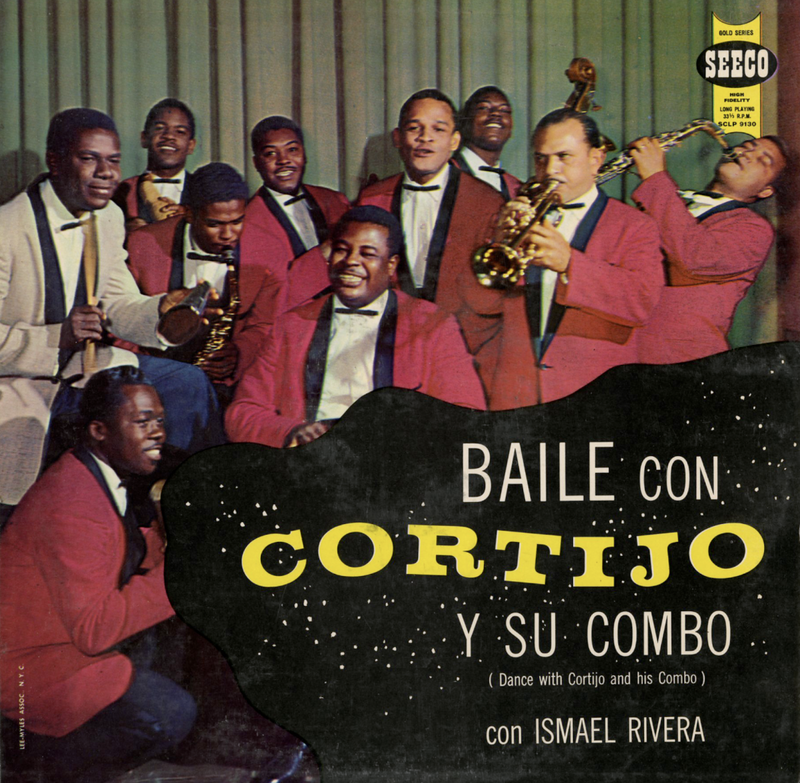 Cortijo is classified as the best interpreter of these songs, especially of the Bomb and Plena. The vocalist, Ismael Rivera is perfectly matched with this group as his singing is considered the best for these songs. SEECO is pleased to release this second LP of Contijo & His Combo. Cover Photo and Design: ARW Productions, Inc. The set is available from online vendors so I will not be posting a sample. Presented here to share the original cover. From the back cover: Just as no Broadway production is ever brought before the footlights without dreams, dedication and years of plain hard work, the same is true of performers such as the Barry Sisters. Claire and Merna have been entertaining professionally since their pre-teen years. They have steadily been gaining the knowledge, experience, and show business knowhow that have brought them to their present position as two of the most professional performers in the entertainment world. 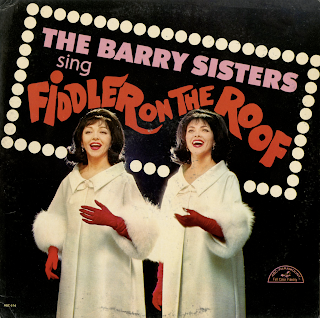 While maturing chronologically and vocally, and building their repertoire in nine languages, the Barry Sisters have become familiar names in the finest supper clubs and on the most poplar television shows, internationally and in the United States; London's Talk of the Town, New York's elegant Persian Room of the Plaza Hotel – where they received standing ovations on opening and closing night – The Copacabana and Latin Quarter; and TV's Ed Sullivan Show," Jack Paar, and "Tonight" shows are just a few of the spots that claim the Barry Sisters as regular tenants. 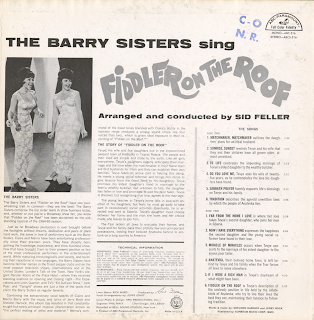 From Billboard - March 20, 1965: The Barry Sisters have a following and so does the Broadway smash, "Fiddler On The Roof." It follows, therefore, that the sister team and the Jerry Bock-Sheldon Harnick score should bring a lot of enjoyment to many fans.